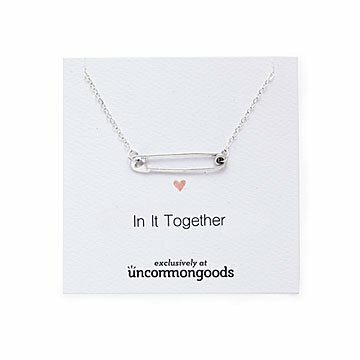 Wear this symbol of unity to show those who may feel vulnerable that you stand with them. Wear this symbol of unity to show those who may feel vulnerable—immigrants, minorities, women, the LGBTQ community—that you stand with them. Look closely and you"ll see the heart in the pin"s clasp, a subtle reminder to yourself of the unity, love, and support that make us one human family. Cast in sterling silver, the design's light material allows the pin to move organically into new positions throughout the day. Made in Bellmore, New York. My beautiful college girl started wearing a safety pin on her shirt to show solidarity and support for all. I was so proud of all the work she did on campus during the election and her compassion for everyone. As a Valentine gift I found this to be perfect. She's not easily pleased and she couldn't wait to put it on and has yet to take it off. It is beautiful and the quality was fantastic. Thank you! Broke within a week of wearing. Bought 2 and both broke in the same place. It's great. It is 16in and I wish I could shorten it a tiny bit, but that doesn't keep me from wearing it! I wear it as a daily necklace with t-shirts and with my scrubs; and it dresses up very nicely with dress clothes as well. It's a good size and I get LOTS of questions about it- which opens up plenty of honest and compassionate discussions. It's a nice looking version. It would be a bit better for actual visibility and support showing if it were a bit larger, but if you're just wanting to wear a pretty necklace that's got a nice meaning for anyone who notices it, this is a good option.